Personal Journeys:American Indian Landscapes will explore the unique relationship American Indians have with land and how that has been expressed in art. Native artists use a variety of media and processes to express their stories, individual creations built on layers of cultural teachings, historical events, personal experiences and spiritual insights. Land as a subject matter for Native artists is a personal journey in history, culture and identity. Origin stories refer to specific locations and have been passed down through generations. Specific sacred landmarks, such as four sacred mountains, define territories. Land has been the cause of conflict with outsiders, and the loss of land is a universal experience for indigenous people. 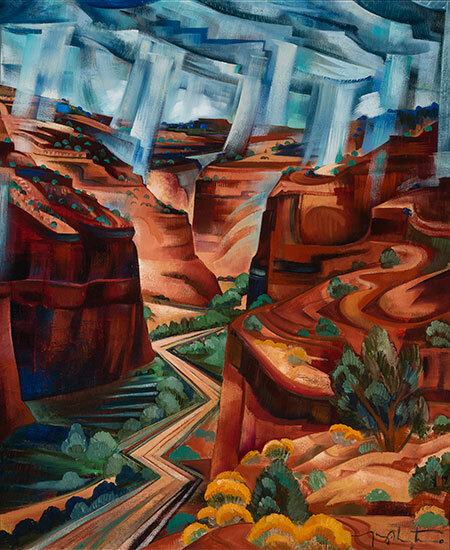 Native landscapes in the visual arts are a convergence of physical place, process and cultural meaning. Image at right: Norman Akers (Osage) uses personal symbols in his paintings to talk about his Osage heritage in relation to the past and present. 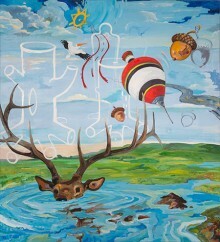 In Spring Matrix (1999) he shows an elk in deep water, a spinning top and an acorn. He also uses ghost-like imagery, such as the tree trunks and human form to make a connection between the present and the past. These symbols evoke stories that are associated with the land, and are a central theme in the artists’ paintings. Heard Museum Billie Jane Baguley Library and Archives librarian Betty Murphy, with curator Janet Cantley, have compiled a bibliography of recommended titles to provide a deeper understanding of the exhibit topic. Click here to download the reading list. Tony Abeyta (Navajo), b. 1965, “Canyon,” 2004, oil on canvas. Gift of American Indian Art Magazine. Norman Akers (Osage), b. 1958, “Spring Matrix,” 1999, oil on canvas. Gift of Morton and Estelle Sosland.